In October 2014, Light Cone initiated artist resideies dedicated to video-based post-production of films that fall within the realm of experimental cinema, with the objective of supporting approximately 10 projects per year. The residency is intended to suit the work-flow of experimental filmmakers, therefore eligibility criteria are deliberately kept open. Short, medium, as well as feature-length films are welcome, on the condition that their shooting is completed and their editing is already advanced, with or without the backing of an independent production company. While the project must fit within the field of experimental cinema, no other criteria (length, nationality of filmmaker, etc.) will be imposed. The Atelier 105 residency seeks to give experimental filmmakers access to professional post-production facilities that are often out of their reach. A fully-equipped workspace located in Light Cone's premises gives artists access to a film scanner for the digitization of 16mm & 35mm film in 2K & 4K, an editing station, sound mixing hardware and software, a color-correction monitor, as well as dedicated computers for encoding video files and DCPs. This equipment has been designated by professionals to allow filmmakers to have the best possible tools at their disposal. 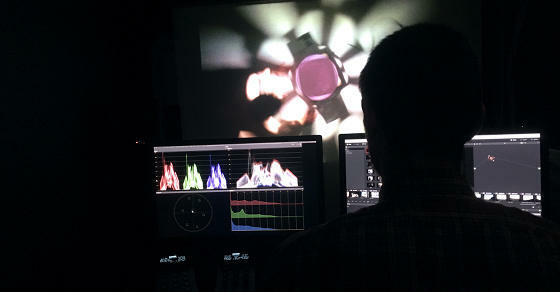 The filmmaker-in-residence also has full access to Light Cone's documentation center and screening room. A technical manager specialized in digital post-production is on hand to assist the filmmaker. Filmmakers are free to work alone or accompanied by their technicians. At the beginning of the residency, Light Cone's technical manager can offer training for Media Composer, Final Cut Pro, After Effects, or Resolve. The filmmakers who have been selected are also able to consult in advance in order to select the formats that are most compatible with the available software. One of our central concerns is to facilitate exchange, to share experience and to create a productive working environment for filmmakers. Beyond technical, logistical and practical assistance, the Light Cone team (made up of filmmakers and/or programmers) also aims to offer artistic guidance and to put in place a genuine platform for experimental creation. Filmmakers are encouraged to consult with our team (concerning technical or artistic issues as well as general advice) and to show them the different stages of the edit. and two external members who are picked among the programmers or filmmakers working with Light Cone (their mandate cannot be renewed). Light Cone welcomes filmmakers to an alternative space for artistic creation based on experimentation and exchange. A Scratch/Atelier 105 public screening will take place in 2019 with a selection of films produced during the 2018-2019 residencies. Submissions are now open for the first residency session of 2019 (February 4 to July 17). Monday, December 17, 2018 (midnight). To submit a project, the candidate must subscribe to the organization by paying a fee of 30€. The candidate will then become a member of Light Cone and will have access to the documentation center for one year. This session will be considered closed after the reception of the 30th submission. An announcement will be posted on Light Cone's website and social media as soon as the quota has been reached. Please read the submission guidelines on Light Cone's website.